ORANGE RECORDS | PHOTO COURTESY Orange Records has a wide range of both new and used records, along with a collection of posters and magazines. We are living in the vinyl revival. The allure of instantaneous, digital music is still there but has been slightly dampened. With so many different music-streaming services fighting for the market’s attention and so many other ways to acquire intangible music, it can all get a little overwhelming. So why not kick it back to the basics and spin some vinyl as the perfect remedy? Lately, the vinyl record music format is becoming more popular; sales have reached historic highs for seven consecutive years. Whether that is because of people craving a more physical form of enjoying music, a desire for nostalgia among older generations or just a new wave of hipsters trying to prove that they are cooler than you, it doesn’t matter. There is nothing quite like the feeling of dropping the needle down on the slick black vinyl and hearing your music come to life. The Fargo-Moorhead area offers a handful of record and antique shops where one can find the newest, oldest and rarest vinyl. 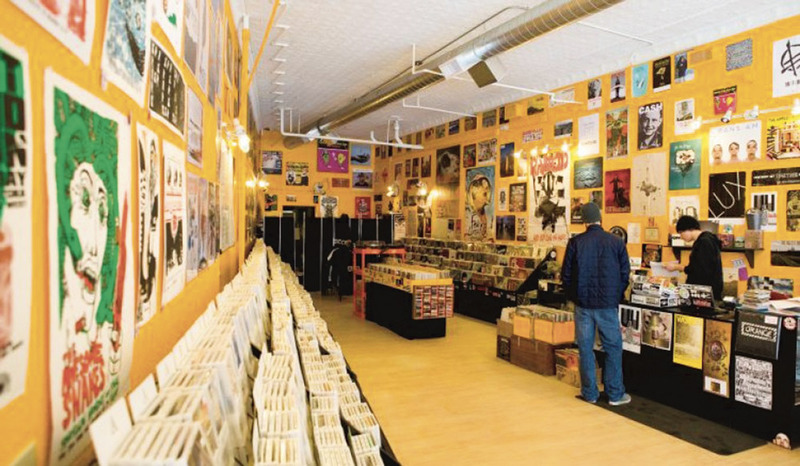 Located in downtown Fargo, Orange Records boasts a wide selection of new and used records and CDs. For those who keep up to date in the current alternative music scene, Orange always has the newest releases in stock, while also carrying a diverse rotation of used, older recordings. The store also offers posters and magazines in its cozy, urban bounds. Whether you are looking for something specific or just wanting to casually sift through the records, Orange Records is a lovely place to get lost in your afternoon. Phat Kat Antiques & Vintage Vinyl contains an entire world of music. With over 20,000 albums in stock, any music lover will be able to find something worth taking home. Phat Kat has the most diverse vinyl selection available in the F-M area, including complete LPs, 45s, collectible records and incredibly rare pressings. If you are struggling finding that one missing piece to your collection, it is no doubt available within Phat Kat on Main Avenue. Mother’s Music is located in Moorhead just across the Red River on Main Ave.
Mother’s has been selling records and CDs since 1970, along with a wide variety of clothing, posters and gifts. With its wide variety of inventory, you are bound to find something of interest. In order to further promote the use of vinyl, certain special editions and limited releases will be available on, and only on, Black Friday. Both Orange Records and Mother will be participating in Record Store Day’s Black Friday event. The stores will be having sales as well to commemorate the tradition of Black Friday. Take advantage of this opportunity to maybe pick up a new hobby while also supporting our local record stores.